Distinctive Character of Burnt Offerings. Animal Offerings of Various Motives. Development of the Whole Burnt Offering. The ordinary translation in modern versions of the Hebrew "'olah" ( ). This term does not mean literally "burnt offering," but "what is brought up" or presented to the Deity. The name is a translation of the Septuagint rendering, which is itself based upon the descriptive phrase often attached to "'olah" in the ritual prescriptions: "an offering made by fire unto the Lord" (Lev. i. 9 et seq.). A synonym is , which defines the offering as complete; i.e., when it is placed upon the altar, to distinguish it from the other forms of animal sacrifice (see I Sam. vii. 9; compare Ps. li. 21). The burnt offering was the highest order of sacrifice in the Old Testament ritual. The bloodless offerings were made only in connection with it. The Offerings: Mode of Sacrifice. These were wholly animal, and the victims were wholly consumed. They might be from the herd or the flock, or in cases of poverty birds might be substituted. The offerings acceptable were: (a) young bullocks; (b) rams or goats of the first year; (c) turtle-doves or young pigeons. These animals were to be free from all disease or blemish. They were to be brought to the door of the tabernacle, and the offerer was to kill them on the north side of the altar (if a burnt offering), except in the public sacrifices, when the priest put the victims to death, being assisted on occasion by the Levites (II Chron. xxix. 34). The blood was then sprinkled around the altar. The victim, if a large animal, was flayed and divided; the pieces being placed above the wood on the altar, the skin only being left to the priest. If the offering was a bird a similar operation was performed, except that the victim was not entirely divided. The fire which consumed the offerings was never allowed to go out, since they were slowly consumed; and the several kinds of sacrifice furnished constant material for the flames. Every morning the ashes were conveyed by the priest to a clean place outside the camp (Ex. xxix. 38-42; Lev. i., vi. 8-13, ix. 12-14; Num. xv.). Kinds and Occasions of Burnt Offering: Stated and Occasional Offerings. (a) Stated Offerings were: (1) The Daily Burnt Offering, presented at the time of the morning and the evening prayer (the third and ninth hours). The victim was a lamb or kid a year old. This was always accompanied by a vegetable offering ("minḥah") and a libation of wine (Ex. xxix. 38-42; Num. xxviii. 3-8). (2) The Sabbath Burnt Offering, which included double the amount of all the elements of the ordinary daily sacrifice (Num. xxviii. 9, 10). (3) The Festal Burnt Offerings, celebrated at the new moon, the Passover, Pentecost, the Feast of Trumpets, the Day of Atonement, and the Feast of Tabernacles. On these occasions, especially on the last-named, the number of victims was increased (Num. xxviii. 11-xxix. 39). (b) Occasional Offerings: (1) When a priest was consecrated (Ex. xxix. 15; Lev. viii. 18, ix. 12); (2) at the purification of women (Lev. xii. 6-8); (3) at the cleansing of lepers (Lev. xiv. 19, 20); (4) at the purgation of ceremonial defilement (Lev. xv. 15, 30); (5) in connection with the vow of a Nazarite (Num. vi. 11, 16). These sacrifices were prescriptive and obligatory; but voluntary burnt offerings might also be made. Some of them are recorded which involved the immolation of a large number of victims (Num. vii. ; I Kings viii. 64). These were the regulations of the Levitical ritual. All of the sacrifices were to be made under priestly auspices; and even when a private offerer killed the victim the main parts of the ceremony were performed by the priests. Yet both before and after the time of Moses the 'olah was offered by laymen without distinction of persons and without restriction as to mode or measure—e.g., Gen. viii. 20, xxii. 2 et seq. (compare xv. 17); I Sam. vi. 14; Amos v. 22; Isa. i. 11; Hosea vi. 6; Job i. 5, xlii. 8—not to speak of the more or less heathenish offering of human victims (Judges xi. 31; II Kings iii. 27; Jer. xix. 5). The name for burnt offering is explained in various ways. Some scholars take it to be an offering of atonement for the evil thoughts that steal over one, , ("ascend in his mind," Tan., Lek Leka, ed. Buber, i. 71; Lev. R. vii. 3); others derive the name from ("to the Highest"), because it is entirely intended for God, the Most High, men taking no part therein (Tan., ed. Buber, iii. 13). The 'olah is the only offering which may be accepted in the Temple from non-Jews, the drink-offering appertaining to it being in such cases furnished at the cost of the community (Men. 73b; Tem. 2b; compare Maimonides, "Yad," Ma'ase ha-Ḳorbanot, iii. 2, 5). The 'olah was laid entire upon the altar, even the horns of the animal and the beard of the goat not being removed (Zeb. ix. 3, 85a; "Yad," l.c. vi. 2). Before being offered upon the altar the carcass was cut into pieces, not at haphazard, but according to the detailed directions given in the Talmud (Tamid 31). The several pieces were then laid upon the altar, the number of priests officiating being eight, eleven, or twenty-four, according as the animal was a sheep, ram, or ox (Yoma 26b). This, however, applies only to the 'olah offered by the whole congregation, not to the individual 'olot, which could be cut up into any number of pieces, and be offered by any number of priests (l.c.). The skins of these animals belonged to the priests, who divided them among themselves every Friday, provided the offering had not proved unfit ( ) before skinning (Zeb. xii. 3; Tosef., Men. xiii. 18). 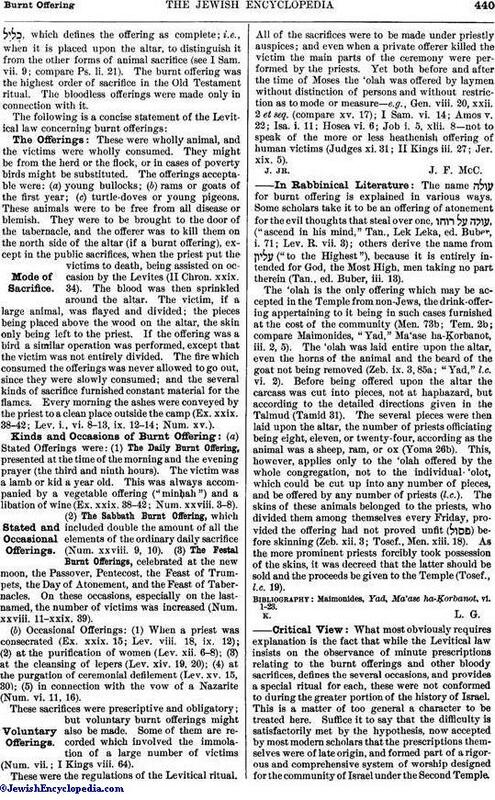 As the more prominent priests forcibly took possession of the skins, it was decreed that the latter should be sold and the proceeds be given to the Temple (Tosef., l.c. 19). Maimonides, Yad, Ma'ase ha-Ḳorbanot, vi. 1-23. 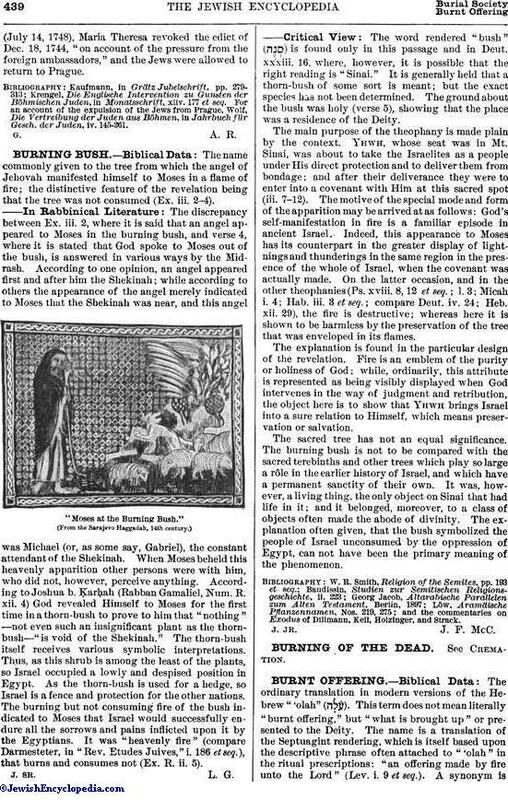 What most obviously requires explanation is the fact that while the Levitical law insists on the observance of minute prescriptions relating to the burnt offerings and other bloody sacrifices, defines the several occasions, and provides a special ritual for each, these were not conformed to during the greater portion of the history of Israel. This is a matter of too general a character to be treated here. Suffice it to say that the difficulty is satisfactorily met by the hypothesis, now accepted by most modern scholars that the prescriptions themselves were of late origin, and formed part of a rigorous and comprehensive system of worship designed for the community of Israel under the Second Temple.Only by cutting loose this final ceremonial law from the tribal and monarchical history of the Hebrews can one gain any rational conception of their sacrificial usages. With this general principle in view one is in a position to answer the two questions of most immediate concern: (1) What was the origin of burnt offerings in Israel? and (2) What were the historical occasions and modes of these sacrifices? There seem to be three stages or phases in the development of sacrifice as representing the relations between the worshipers and the Deity. In the first, communion is prominent; in the second, homage or devotion; in the third, expiation. The most primitive notion was that of communion with the object of worship, held to be akin to his votaries, who partook of his life. The Deity, however, was also a benefactor. It was from Him that the various kinds of offerings, animal and vegetable, as the produce of the land, came to the offerers. Hence, on the one hand, a sacrifice was a part of a social feast—a family meal in a wider and deeper sense. On the other hand, it was the giving back to the beneficent Deity of a part of what He had bestowed: it was in fact the most tangible and obvious mode of rendering homage to one's God. Only a part of the whole was at first offered; otherwise there would have been no sacrificial feast, no communion with the Divinity. But what should be chosen as the offering? and how should it be rendered? The Deity, being invisible, would be most suitably entertained by a more ethereal form of nourishment than solid food. Hence arose the custom of burning certain portions of the animal offerings or materials of the feast. The most appropriate of all were the fatty parts of the animal, which in general among ancient peoples, as among the Hebrews, were consumed by fire, while the remainder of the flesh was eaten by the human participants. This was the "zebaḥ," the fundamental animal offering. From this universal type of sacrifice the 'olah was differentiated. The "wholeness" of the oblation was what distinguished it from other fire-offerings, at least in outward form. But this wholeness was not an exclusive mark of burnt offerings among sacrifices in general; for it merely implied that no part of the oblation was to be consumed by any one except the Deity, to whom it was wholly surrendered. Among various peoples it may be observed that offerings of any sort of vegetables were given unconsumed by the offerers; and among the Hebrews even some forms of the fire-offerings were wholly consumed on the altar. Thus the "minḥah," or cereal-offering, when offered by a priest, was to be entirely burned (Lev. vi. 20 et seq.). Also the bullock of the sin-offering, when the offense had been committed either by a priest or by the whole people, was burned entire outside the camp (Lev. iv. 3-21), even the skin being consumed, which was not the case with the burnt offering. What, then, is the distinctive meaning of the whole burnt offering? It is plain that it was not of a sacramental character, implying a communion with the object of devotion; for it is expressly distinguished from those in which the elements were portioned out between the Deity and the worshipers. Nor was it, in any sense or degree, a festal ceremony. Was, it then, piacular or expiatory? Not distinctively so, according to the Levitical ritual, though it must be borne in mind that the idea of expiation was probably never wholly absent from the stated order of animal sacrifice in the final legislation. From the special occasions of its celebration as given above, it may be inferred that it was honorific and devotional, implying homage to Yhwh and a complete surrender to His service. Was this always the case in Israel? Some light may be thrown upon this question from the Biblical statements as to the occasions of such sacrifices in the earlier history, and from the details which are added to some of the accounts. Piacular sacrifice seems historically to have begun with human immolations. This is the view taken by the writer of Gen. xxii. (E), where the burnt offering of Isaac by Abraham is commuted by the sacrifice of a ram. The sacrifice by Mesha, king of Moab, of his eldest son (II Kings iii. 27) was expiatory; for, in the view of the narrator, the "wrath" of the offended deity was diverted upon Israel. Such were also the horrible sacrifices made to Moloch in the later days of the kingdom. These practises are amply illustrated from other ancient nations. But not all Old Testament human sacrifices were burnt offerings. Agag was not burned (I Sam. xv. 33); nor were the seven sons and grandsons of King Saul (II Sam. xxi. 8, 9). Both of these executions were made "before Yhwh," and were therefore real sacrifices, the latter being expressly stated to be expiatory. When animals took the place of human offerings a motive for the immolation of the whole victim was not present, or at least not urgent. 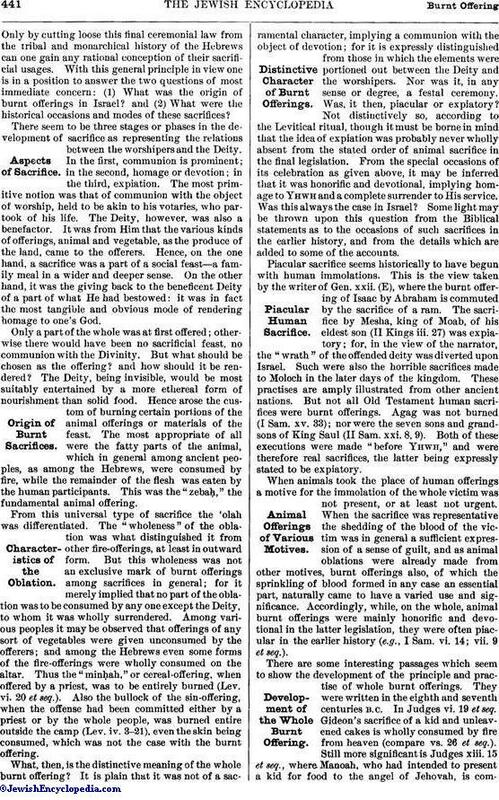 When the sacrifice was representative the shedding of the blood of the victim was in general a sufficient expression of a sense of guilt, and as animal oblations were already made from other motives, burnt offerings also, of which the sprinkling of blood formed in any case an essential part, naturally came to have a varied use and significance. Accordingly, while, on the whole, animal burnt offerings were mainly honorific and devotional in the latter legislation, they were often piacular in the earlier history (e.g., I Sam. vi. 14; vii. 9 et seq.). There are some interesting passages which seem to show the development of the principle and practise of whole burnt offerings. They were written in the eighth and seventh centuries B.C. In Judges vi. 19 et seq. Gideon's sacrifice of a kid and unleavened cakes is wholly consumed by fire from heaven (compare vs. 26 et seq.). Still more significant is Judges xiii. 15 et seq., where Manoah, who had intended to present a kid for food to the angel of Jehovah, is commandedto make of it a burnt offering. Thus we may observe the development of the zebaḥ into the 'olah. Jeremiah, when he says: "Add your burnt offerings to your [ordinary] sacrifices" (vii. 21), seems to have in mind the ritual tendency just indicated. 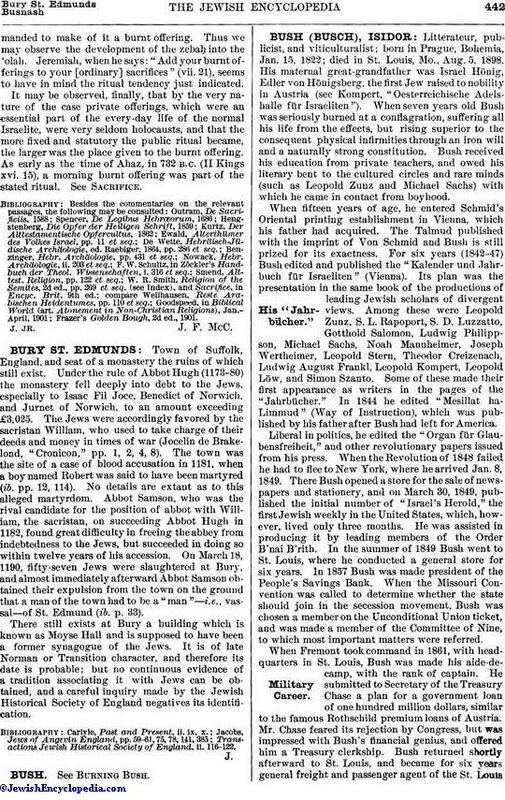 It may be observed, finally, that by the very nature of the case private offerings, which were an essential part of the every-day life of the normal Israelite, were very seldom holocausts, and that the more fixed and statutory the public ritual became, the larger was the place given to the burnt offering. As early as the time of Ahaz, in 732 B.C. (II Kings xvi. 15), a morning burnt offering was part of the stated ritual. See Sacrifice. Frazer's Golden Bough, 2d ed., 1901.